In addition to being commissioned to produce all of the building-related systems, Moekotte was given various additional tasks relating to the replacement of the existing control systems and the integration of the new controls into the new process. 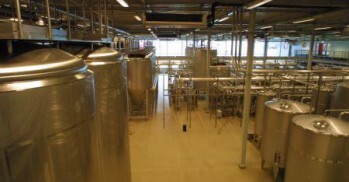 This process included transport systems that were being relocated from the old brewery to the new brewery. Moekotte replaced and/or adapted various control systems, including those for the bottle filling line and the conveyor for transporting the swing-top bottles to the swing-top line. 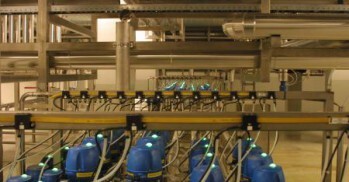 In addition to this, Grolsch now has a new site for the collection of process water. This new site in Hengelo (Veldwijk) comprises a control panel with frequency regulators and remote I/O to facilitate the pumping of water to the brewery. Communication between these two sites is achieved by means of a 10 km long fibre optic cable and Siemens Scalance routers. Thanks to the replacement of the old Siemens S5 controllers, the entire brewery in now standardised on Siemens S7 configurations. Furthermore, all terms (TAG and description) have been adapted to the standard that is employed within Grolsch. The same is also true of the design of the PLC/HMI software.